« My department is hiring! 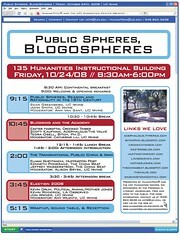 I’m on my way to UC Irvine to participate with some very cool folks in a meeting called Public Spheres, Blogospheres hosted by UCI’s HumaniTech. I’m on a panel about Blogging and the Academy. I suspect the question of whether or how junior faculty should blog will come up. While it’s a topic I’ve pondered here numerous times and it may make some people yawn at this point, I believe it’s still worthy of discussion with some points that haven’t been considered sufficiently yet. More on that when I get around to organizing my thoughts about it (this conference would be a good opportunity for that, hah). Academics from different fields will be represented at this meeting, which may lead to different takes on the topic. I look forward to the conversations. This entry was posted on Thursday, October 23rd, 2008 at 3:21 am	and is filed under Academia, Blogging, IT/Comm, Travel. You can follow any responses to this entry through the RSS 2.0 feed. Both comments and pings are currently closed. i’ll be there — looking forward to it! Ooh, excellent, please come over and say hi! most definitely — happy travels! Too bad we have class right now… But we’re talking about you-good things. Thanks for your note, Paul. Sorry to hear about the time conflict, we’re having some great discussions at the conference.